Washington Navels are one of the all time best eating oranges around! Washington Navels are seedless, sweet, juicy and protected by a thick rind. 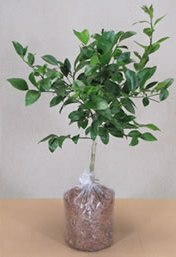 As a tree they are one of the best indoor growing citrus trees available for containers. And because they will grow larger outside, they are just as spectacular when planted in the ground. With beautiful and fragrant blossoms in the spring and delicious fruit in the winter, the dwarf Washington Navel Orange is a winner all the way around!